Florence has gathered so many art masterpieces, so much history, it gave birth to so many great minds and up to this day offers so many stunning views that no matter how many times you visit the “capital” of Tuscany, you still won t be able to say: “I now know this city perfectly”. 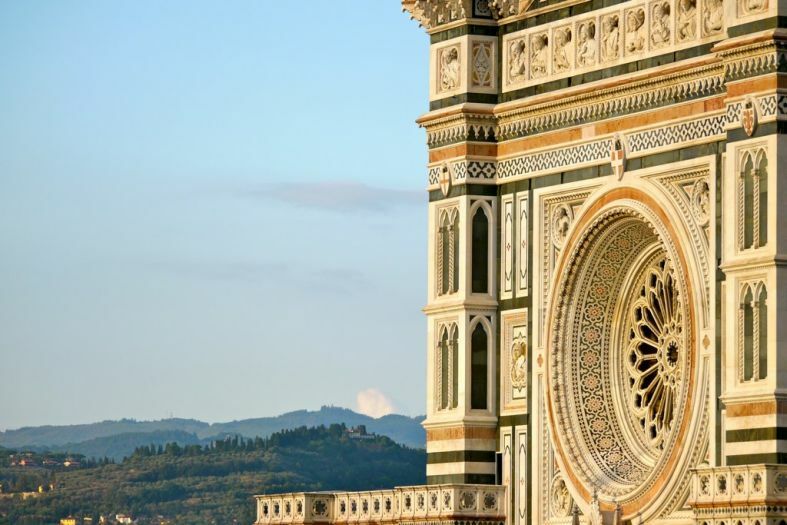 The list below contains the sights of interest in Florence, which you must see. How much time you will spend doing it – that s up to you. The Cathedral of Saint Mary of the Flower (Il Duomo Santa Maria del Fiore) – the world’s third biggest cathedral. Its octagonal dome with no external buttresses is revolutionary for its time. In addition to the beautiful mural paintings and frescoes, a colossal clock from 1443 awaits you – it is in working order to this day and runs counter clockwise. 463 steep steps lead to the top of the cathedral, giving a magnificent view. It is located at Duomo Square (the cathedral’s Square – Piazza del Duomo). Piazza della Signoria – this is the heart of Florence, the biggest city square. Here stands the Old Palace (Palazzo Vecchio) with the clock tower, in front of which aristocrats met in the past. The square is surrounded by sculptures by famous artists, among which is a reproduction of Michelangelo’s David. Go to one of the cafes and enjoy a cup of espresso, delicious tiramisu and unforgettable views to the city. The Fountain of Neptune (Fontana di Nettuno) – according to a legend the water-splashing bronze statues of mermaids, fish and sea nymphs come to life at full moon. Neptune’s statue is 4.2 m tall and was created by Bartolomeo Ammannati. It was erected between 1565 and 1575. It is located at Piazza della Signoria, next to Palazzo Vecchio (the Old Palace). The Old Palace (Palazzo Vechio) – You will recognize the Old Palace from a distance by its clock tower. It was built in Gothic style. Until 1540 the council governing the city (Signoria) held its meetings there. The Palace also used to be home to the Medici family. Today, among the halls open to visitors, are the beautifully decorated Hall of Lilies and the Room of the Elements. The city government still holds its meetings here. The Palace is situated at Signoria Square. Ponte Vecchio (the Old Bridge) – if you are crossing the bridge with your loved one, don’t forget to bring a padlock, lock it to the bridge and throw the key into the river so that your love lasts forever. The covered bridge spans over Arno River since 1345. The shops here used to be owned by fishermen and butchers, but the Medici drove them away because of the unpleasant smell, and brought goldsmiths and jewelers instead. The jewelry shops are still among the most prestigious and expensive shops today. According to a popular urban legend Germany never bombarded Florence and the bridge because it was Hitler’s favorite city. This is probably not true but the view of the bridge would not let you destroy it either. Michelangelo Square (Piazzale Michelangelo) – this is the highest point in Florence and one of the most romantic places in the city. Florence is in your feet! You can enjoy a magnificent view to most of Florence’s sights and Arno River from here. The most famous sculpture by Michelangelo is situated in the center of the square – “David”, there are souvenir stands around everywhere. It takes about 20 minutes walking from the city center to get here. Uffizi Gallery (Galleria degli Uffizi) – unique art pieces from different epochs are displayed here, among which pieces from the huge collection of the Medici. You will see paintings and sculptures by Giotto, Michelangelo, Raffaello, Rubens, Titian, Leonardo da Vinci and other famous artists. From the gallery terrace you can enjoy a beautiful view to Ponte Vecchio (the Old Bridge) and Arno River. It is at the last floor in the Uffizi palace. Basilica of the Holy Cross (Basilica Santa Croce) is famous as the tomb of many famous people from Italy. Michelangelo, Galilei, Machiavelli, Dante Alighieri and other Renaissance artists and explorers were buried here. It was built in a Gothic style with a rich façade and stained glass windows. It is located in the center of Florence. Gate of Paradise (Porta del Paradiso) – the east doors of the Baptistery of Saint John – one of the oldest buildings in Florence. The two huge wings of the gate shine, decorated by gilded bronze, representing biblical plots. The frame of the doors is richly decorated with flowers, birds and characters from the Bible. It is close to the Duomo. The National Museum of Bargello (Museo nazionale del Bargello) is a completely preserved palace from 1255. Paintings and sculptures by Michelangelo, Donatello, Verrocchio as well as lots of weapons and ceramics are collected in its spacious halls. The headquarters of the military captain (bargello) was here, hence the name of the palace. It used to be barracks and prison before it was turned into a museum. Gallery of the Academy (Galleria dell Accademia) – the original sculpture “David” by Michelangelo as well as many more sculptures and paintings of Florentine artists are kept here. A musical section was opened in the gallery where old musical instruments are displayed. It is located in the center of the city. Pitti Palace (Palazzo Pitti) – this is the biggest palace in Florence. It used to be a residence of the great dukes of Tuscany. Here you can find the Silver Museum, the Carriages Museum, the Gallery of Modern Art with rich collections of paintings and sculptures as well as the Porcelain Museum and the Costume Gallery devoted to the history of fashion. You just have to walk around the splendid Boboli Gardens (Giardino di Boboli), part of the palace, with beautiful fountains and artificial caves. It is located at the southern coast of the Arno river, close to Ponte Vecchio (the Old Bridge). House of Dante Museum – it’s a reproduction of a tower house from the 18th century and is located in a city area, which historians consider to be the birth place of Dante. You will see documents, maps and drawings related to the life and work of the writer. There is also a book store, where the writer s works are sold both in Italian and many other languages. You can find it at 1, Santa Margarita Str. The Boar (Il Porcellino) – the bronze statue at the central market in Florence, close to Signoria Square. The original marble figure, found in Rome and brought by the Medici to Florence in 16th century, is kept in Uffizi Gallery. The copy in the central market was cast by Baroque master Pietro Tacca. If you rub its snout, you will get rich or you will come back to Florence. If you put a coin in the boar s snout and it falls through the underlying grating, your wish will come true. Are you ready with coins for a wish or two? Grab an ice-cream – you can try very delicious and very exotic ice-cream here. At the ice-cream carts in the town or in the small ice-cream parlors, together with the lemon, strawberry, stracciatella, chocolate flavors, you will also find flavors you didn’t even think existed. Learn how to choose the best ice-cream in Italy. Shopping in Florence – there are beautiful and expensive jewelry in the Ponte Vecchio (the Old Bridge) stores. Prada, Gucci and Armani have producer s stores in the outskirts of Florence; at the end of the fashion season you can buy clothes at half price there. There are mainly jewelry at Ponte Vecchio. At the Sunday flea markets, organized in the small streets, you can find any goods at bargain prices. At the Central Market (Mercato Centrale) during the week and at the New Market (Mercato Nuovo) next to Ponte Vecchio there are carts with fresh fruit, cheese, bread as well as clothes, leather goods, ceramics and home goods at accessible prices. You will also see many outdoor carts selling all kinds of leather goods – bags, belts, gloves. They are famous for their high quality, and at the end of the day many sellers are willing to bargain and give you a significant discount. Nightlife in Florence – the night life in Florence is concentrated in the bars around Signoria Square in the city center. A diversity of live music clubs, bars, discos as well as elegant restaurants with Tuscan specialties. A beautiful end of the evening could be the romantic view to Florence’s lights from Michelangelo Square. The night city is expecting you. Ready, steady, go!